Believing his traitorous brother Dimitri (Pierce Brosnan) is somewhere in the stadium, Arkady (Ray Stevenson), the former leader of a revolution in the Russian state of Sukovia, locks down the Boleyn Ground during the European semi-final between West Ham United and Dynamo FCC. 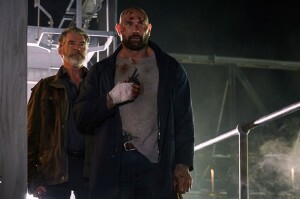 In the crowd with his niece, Danni (Lara Peake), is US- veteran Mike Knox (Dave Bautista), who stumbles upon the plot and goes about taking out Arkady’s heavily armed team. Can he get to Arkady before Arkady gets to Dimitri? The fate of 35,000 people inside the stadium – and many more in Russia – depends on it. 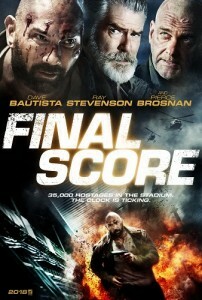 This is a by the numbers action flick but has some decent performances to warrant a watch. Dave Bautista has that old school vibe that the likes of Stallone or Arnie used to ooze back in the day and he walks around banging heads in the same fashion. The stand out moment being a great scene with Lee Charles when they go toe to toe. 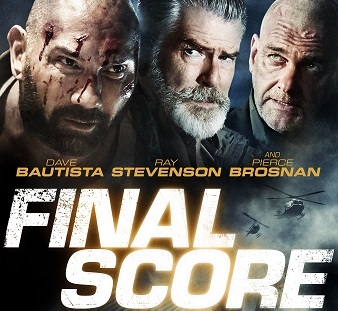 Pierce Bronson gets to cackle and chew up the scenes as always an finally Ray Stevenson gives a great performance as the villain.